On Saturday, May 22, 1943, two Army P-47 fighter planes collided in mid-air over the city of Holyoke. One aircraft, (Ser. No. 41-6072), was piloted by 2nd Lt. Charnelle P. Larsen, 22, of Lakeland, Florida. 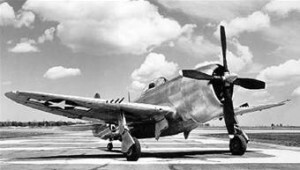 The other P-47, (Ser. No. 41-6050), was piloted by another 2nd lieutenant. Both men were assigned to the 321st Fighter Squadron based at Westover Filed in Chicopee, Massachusetts. The accident occurred at 6:20 pm, and numerous people saw the collision and watched the planes come down. As both aircraft began to fall, the pilot of P-47 #41-6050 bailed out while the aircraft was at an altitude of only 700 feet, and remarkably, and his parachute opened successfully. His airplane crashed into a large tree before striking the side of a two-story brick house at the corner of Hampden and Linden Streets where it exploded into flame. The pilot meanwhile landed safely in a nearby tall tree on Linden Street, but had to wait to be rescued. A mother and her two older sons were in the house at the time, but were not seriously injured. A mailman was wounded when the flames began setting off the machinegun bullets in the wrecked airplane. One bullet struck him in the right hand, but the injury was not life threatening. As to Lieutenant Larsen, one wing of his aircraft was severely damaged from the collision, but he fought to maintain control because he was over a heavily populated neighborhood. Witnesses reported seeing him try to steer his plane away from the area, but it continued to fall despite his best efforts. He was killed instantly when his plane crashed and exploded in an alleyway between the homes facing Pine and Beach Streets, to the south of Appleton Street. While some buildings suffered damage, there were no reported injuries. One account stated the aircraft came down behind 200 Pine Street. Lt. Larsen was praised by the Mayor for his heroic decision to remain with his aircraft in order to protect civilians on the ground. Holyoke Daily Transcript, “Lt. Larsen Dies Avoiding Local Homes In Saturday’s Double Crash”, May 34, 1943, page 1.